A handmade shrine of Mary, Grace of the Miraculous Medal. This is an altered wooden shrine covered in vintage hymn paper - the hymn . 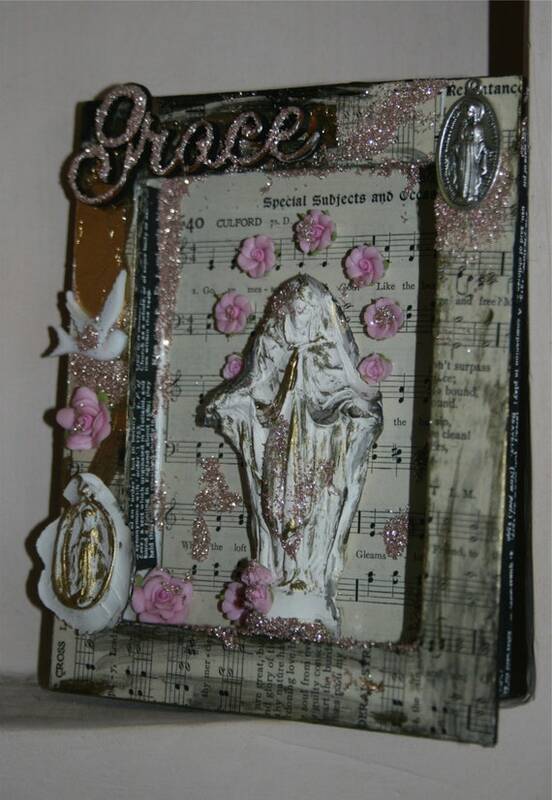 Inside is a hand sculpted clay statue of Mary, Lady of Grace as well as a hand molded clay Miraculous Medal. On the top right hand corner is a silver Miraculous Medal, which I bought at the Chapel of the Miraculous Medal in Paris, France. 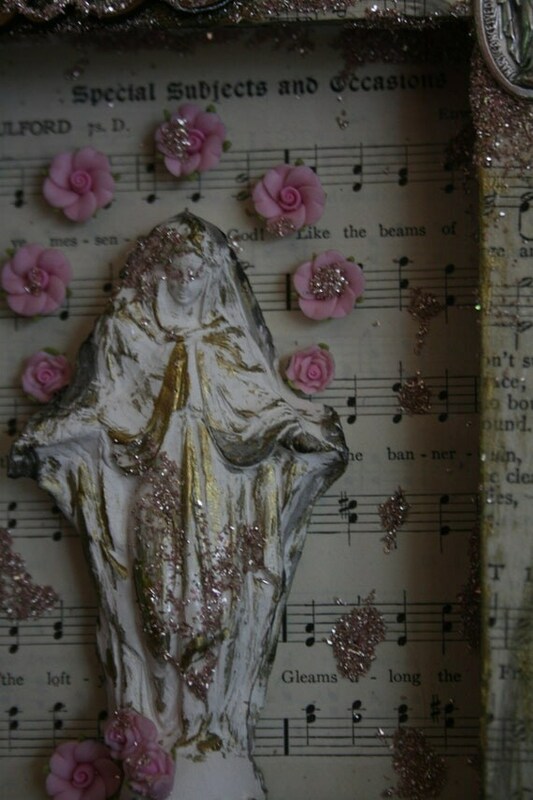 Mary and the clay medal is painted in white, touched with gold and real German glass glitter in the palest pink is sprinkled everywhere. Mary's halo is made from small porcelain roses. The inside and outside of the shrine is covered with book binding tape with quotes and definitions on 'love', 'bliss' and 'daughter'. A small white dove on the side represents the Holy Dove, the symbol of the Divine Feminine through the ages : all the goddesses of Love had the Dove as their symbol, Aphrodite, Ishtar, Inanna and Mary is no exception. When Mary appeared to St Catherine Laboure in 1830, in the chapel in Paris, Her hands were covered in jewels. From some of the jewels, rays of light shown which she said were symbols of the graces that would be given to all who asked for them. The jewels that had no rays were symbols of unclaimed graces. An oval frame outlined the figure bearing in gold letters the words 'O Mary, conceived without sin, pray for us who have recourse to thee'. This chapel is still used for worship in Paris and the most beautiful statue of Our Lady of the Miraculous Medal was placed over the main altar in the chapel where Mary appeared. I visited this chapel and wrote about my wonderful experience, bathing in Mary's Love while sitting there. I was so inspired by the beauty of the artworks and the chapel itself : to mosaics, the statues, everything glittered and shone with gold and reflecting mosaics and rays of gold - and this is what I tried to capture in this small shrine to Her Grace. You can read more about my pilgrimages to sacred sites and how these inspire my art on my blogs http://pathofdivinelove.blogspot.com and http://hergracedevata.blogspot.com and specifically here : http://www.path-of-divine-love.com/2012/10/mary-grace-of-miraculous-medal.html. Part of the Divine Mary shrines. 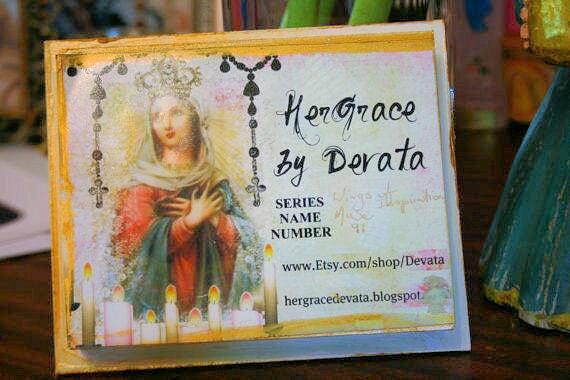 All my shrines come with a catalogue number, name and label. 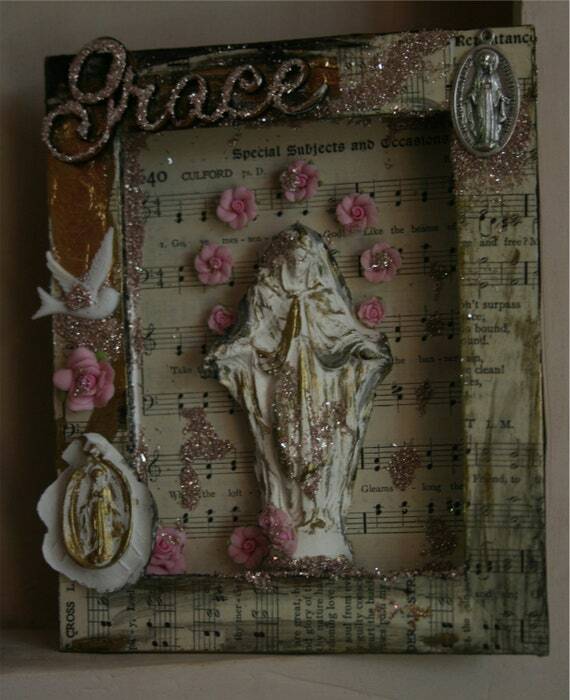 I love the vintage hymn as the backdrop of your exquisite Mary shrine.